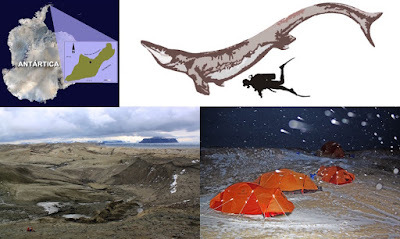 Approximately 66 million years ago, an ancient sea monster that has a very large size roughly the size of a five-story building once dominated the dark Antarctic marine life. Those sea creature called the mosasaur, an aquatic reptiles that lived during the Cretaceous period. One of its characteristics is the use of its limbs like tail for paddling. Unfortunately, there is not plenty of evidence that can be used to uncover these sea monsters. Until the end of an expedition was held to find evidence of the continuation of the specimen. For days the researchers who are members of the Chilean Paleontology Expedition try their luck to get a mosasaur fossil. But before the days of their trip, in the middle of a storm and bad weather the researchers did not find any. Had felt desperate and consider their journey in vain, until finally they managed to find a mosasaur skull on Seymour Island in January 2011. This discovery became the long-awaited given this specimen was the second fossils found in Antarctica. But unlike before, this time the mosasaur fossils have very large size. It is based on the size of the anatomy of the skull found with a width of 4 feet or 1.2 meters. While the entire body of reptiles stretches about 33 feet (10 m), making it the largest marine predators in the region. Researchers also gave the name 'Kaikaifilu hervei.' In which Kai-Kai-filu is the myth of the culture of the Mapuche in Southern Chile and Argentina, which means the giant reptiles were in charge of the oceans. While the hervei word derives from the name Francisco Herve, a Chilean geologist and also an Antarctica adventurer. "Previously, evidence of the existence of such gigantic size mosasaur like Kaikafilu hervei was unknown. Yet Antarctica has an abundant amount of plesiosaur," said Rodrigo Otero, a palaeontologist from the University of Chile as quoted by LiveScience on Wednesday, November 9, 2016. Plesiosaurs was a long-necked marine reptiles that became the main prey of Kaikafilu hervei. Although now Antarctica is a cold continent, but when the dinosaur age the conditions are much warmer. A group of swimming animals in the region to make a food haven for Kaikafilu hervei.